In the G.O. 4th read above, orders were issued framing rules relating to the admission of students into Elementary Teacher Training Institutions / District Institutes of Education and Training (DIETs) through Common Entrance Test Rules, 2017. In the G.O. 5th read above, Orders were issued, framing the Telangana State Direct Recruitment for the posts of Teachers Rules, 2017. In the G.O. 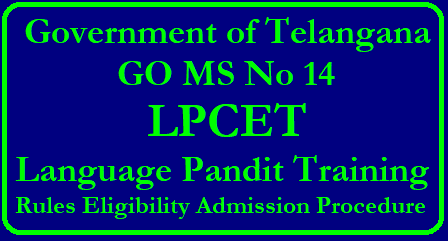 7th read above, certain amendments were issued to the Telangana Conduct of Language Pandit Common Entrance Test for admission into Pandit Training Course Rules, 2006. The Commissioner & Director of School Education, Hyderabad, in his letter 8th read above, has furnished proposals for the issue of fresh rules for the Telangana Language Pandit Training Colleges (Regulation of Admissions into Pandit Training courses through Common Entrance Test) Rules, 2018, in supersession of G.O.Ms.No.29, Education (SE-Trg-1) Department, dt.29.03.2007 and G.O.Ms.No.29, Education (SE.Trg) Department, dt.20.02.2008. After careful examination of the proposals of the Commissioner & Director of School Education, Hyderabad, Government hereby decided to issue fresh Rules relating to the Telangana Language Pandit Training Colleges (Regulation of Admissions into Pandit Training courses through Common Entrance Test) Rules, 2018. Accordingly, the following Notification shall be published in the Telangana Gazette. NOTIFICATION In exercise of the powers conferred by sections 3 and 15 of the Telangana Educational Institutions (Regulation of Admissions and Prohibition of Capitation Fee) Act, 1983 (Act No. 5 of 1983) and in supersession of the Telangana Language Pandit Training Colleges (Regulation of Admissions into Pandit Training courses through Common Entrance Test) Rules, 2007, issued in G.O.Ms.No.29, Education (SE-Trg-1) Department, dt: 29.03.2007 and as amended in G.O.Ms.No.29, Education (SE-Trg) Department, dt:20.02.2008, the Governor of Telangana hereby makes the following Rules for the admission of the students into Language Pandit Training Colleges in the State of Telangana. The candidates should satisfy Local / Non-local status requirements as laid down in the Telangana State Educational Institutions (Regulation of Admissions) Order, 1974 as amended from time to time for admission into all seats in Government Colleges of Teacher Education and Category ' A ' seats in Private Un-aided Non-Minority and Private Un-aided Minority Pandit Training Colleges. Candidates should have obtained a rank in LPCET conducted for the academic year concerned and should satisfy the educational criteria prescribed for the course as shown at (iv) below. For obtaining a rank, candidate belonging to “OC” and “BC” Communities shall secure 35% marks in LPCET. For Scheduled Castes and Scheduled Tribes there shall be no minimum qualifying marks for allotment of seats reserved under the respective categories. That is to say candidates belonging to Scheduled Castes and Scheduled Tribes Communities should secure 35% of marks for consideration against seats under open category (OC). Similarly, candidates belonging to Scheduled Castes and Scheduled Tribes Communities should secure 35% of marks for consideration against seats under NCC/ Defence Personnel or their children and spouses / Sports category. Must possess Graduation with Urdu as one of the Optional subjects/ Graduation in Urdu Literature/ Bachelor’s Degree in Oriental Language (BOL) in Urdu / Post Graduation Degree in Urdu, from a University recognised by UGC with minimum 50% marks (In case of SC / ST / BC / Differently abled candidates, the minimum marks shall be 45%).